One weekend, about 15 years ago, Keizer’s newest First Citizen, Joe Egli, wanted to go to Costco and buy a play structure for his kids, Madi and Noah. However, he didn’t have a way to get it back to his house after making the purchase. Fortunately, one of his neighbors, Mike Kurtz, was an acquaintance through the Rotary Club of Keizer and he owned a pick-up truck. Fifteen years later, he’s still somewhat shocked by the kind gesture, but that experience fuels his desire to be an active part in the community. “Everything I’ve given, I’ve gotten back tenfold. Every little bit you can give back makes a difference,” Egli said. Egli didn’t move to Keizer until 1996, but he was a frequent visitor to the area as a child and worked here during the summers as a painter beginning at age 13. He eventually struck out on his own with a painting business and that’s when his civic engagement began in earnest. Soon after starting his own business, Egli was sold a ticket to the Rotary Raffle by another Rotarian, Kim Girouard, and he began asking how he might get more involved with the group. “I remember I was sitting next to Jim Hupy at one of the meetings and he was telling me about the old schoolhouse. It had just been moved and the plywood was still on it and nothing else was happening. He thought if he could just get the plywood off of it, people might be more motivated to get involved in preserving it,” Egli said. Elgi did Hupy one better, he said if Hupy could arrange for buying the paint, he would paint it for free. “In hindsight, I wondered what I was doing offering to do it. It’s a bigger building than you realize,” Egli said with an exasperated chuckle. Still, Egli was undeterred. He would eventually serve as president of Rotary and began taking on larger roles in civic projects. When another member of Rotary committed the group to helping create the focal point at the corner of Chemawa Road North and River Road North, Egli quickly became the supervisor for the project. Through the enlistment of a small army of volunteers and in-kind donations, the focal point rose up from a gravel lot that was once a gas station. “We were looking for a saying to put on the fountain and we were just tossing out ideas and someone said, ‘Pride, Spirit and Volunteerism.’ We all stopped and said, ‘We’re done.’ Everyone in the room knew that was the right thing to put on there,” Egli said. 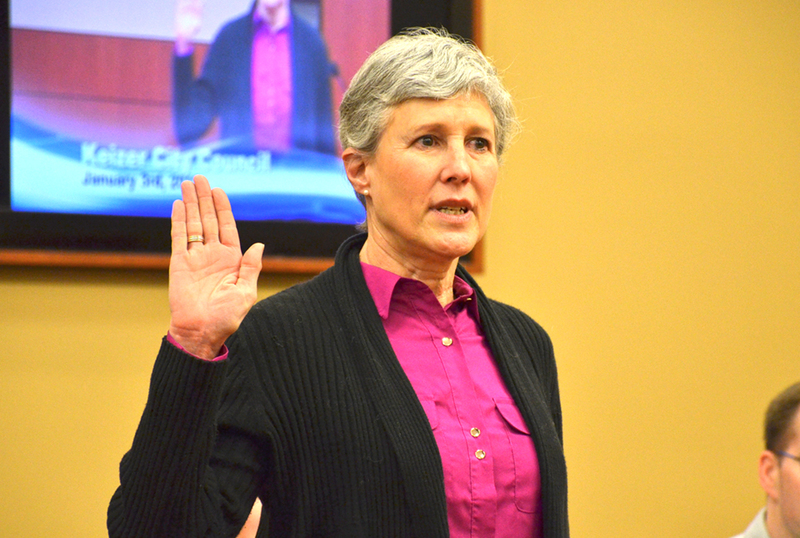 Christine Diecker, the former executive director of the Keizer Chamber of Commerce, enlisted Egli to run the Keizer Chamber of Commerce’s Economic Development and Government Affairs (EDGA) Committee and that helped him set his sights on a seat on Keizer’s City Council. “I got interested in the council through EDGA. When (former City Councilor) Richard Walsh decided to leave the council, he approached me and asked if I would be interested in running,” Egli said. Egli was and he served one term as a city councilor. Among the major hallmarks of his time on the council were efforts to move the Chamber of Commerce office to Keizer Station, ushering in the move of the Festival of Lights Parade to Keizer from Salem, and determining the city’s position in an attempt by Keizer Fire District to annex a portion of north Keizer that was, and still is, served by Marion County Fire District No. 1. 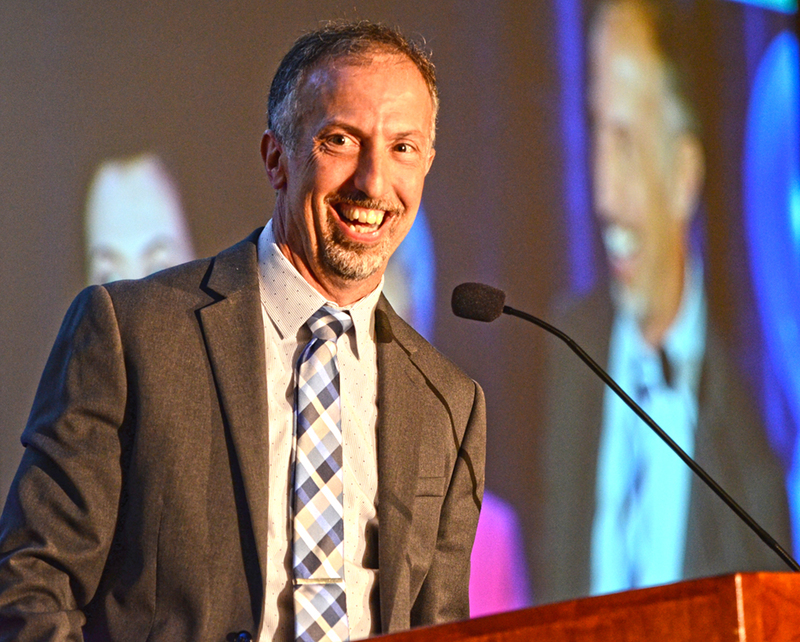 More recent volunteer work includes serving on the board of the McNary Athletic Booster Club as treasurer and a spot on the board of directors for the Salem-Keizer Education Foundation. His role with SKEF ended up creating an opportunity for him to fly to southern California last year and drive back in a donated bookmobile. “You always hear about people making trips like that and I figured this was my shot. But, man, that was rough. It was like driving a semi,” Egli said. Egli, who is now agent with Brown Insurance Agency in Woodburn, said he feels the relationships he’s developed through volunteering have helped him be successful in his business endeavors. Alex and Bella Beard tried to quit swimming once. As 7-year-olds, wanting to be like their older sister, the Beard twins went to Holiday Swim Club. At their first practice, Bella swam one length of the pool, got out and quit. Alex made it about halfway before she figured out what her sister had done and followed. Their swimming career was over. Until the next summer when their dad gave them an ultimatum to give it another shot or enroll in swimming lessons. The twins enjoyed their second stint at Holiday so much that they decided to join a year-round club. “Were were doing gymnastics and we were really quite bad at it,” Alex said. “We realized we sucked and then joined swim team.” Bella added. On the Bearcats, which later became Mid-Valley Aquatics, the Beards swam their first state qualifying times as 9-year-olds. Bella got her’s first in the 100 breaststroke and then the 50 breaststroke. Not to be outdone, Alex then qualified for state in three events—the 50 breast, 100 breast and 50 free. “I think I’m much more competitive than Alex is,” Bella said. That dynamic has worked for the Beard twins, who as 10-year-olds swam in their first sectional meet in Federal Way, Wash. Competing against swimmers from Hawaii and Alaska and east to Montana, they finished seventh in the 200-free relay, despite being seeded 27th. “I got to swim with my best friends on this relay and we were so excited,” Alex said. Bella has qualified for sectionals four years in a row. At state, Alex placed fourth in the 500 free when she was 11. 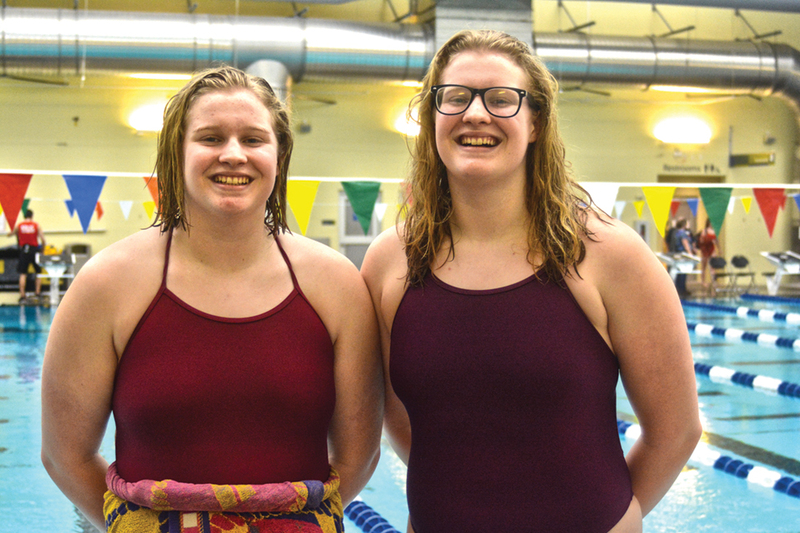 Now as freshmen at McNary, the twins will swim in their first Greater Valley Conference Championships on Feb. 9-10. With injuries to seniors Marissa Kuch and Sarah Eckert, Alex and Bella have led the Lady Celts this season. On the gold squad at Mid-Valley Aquatics, with three hour practices a day, they are only able to attend one McNary practice a week. That sportsmanship and humility comes from their father. Individually, Bella will swim the 200 free and 100 breaststroke at the GVC Championships while Alex will compete in the 200 IM and 500 free. Their best times would have been good enough to get them to A Finals (top eight) in all four events at last year’s district meet. They’ll also swim on McNary’s 200 free and 200 medley relay teams. The twins want to break records during their high school career. Alex’s PR in the 200 IM is 2:24.66 and 5:35.58 in the 500 free. Bella’s best times are 1:13 in the 100 breast and 2:08 in the 200 free. McNary school records are 2:10.86 in the 200 IM, 5:18.32 in the 500 free, 1:08.80 in the 100 breast and 1:53.75 in the 200 free. Since they were 9, Alex and Bella have swam year-round with only three weeks off in August. “It takes up all of my time. I wouldn’t do anything else,” said Alex, who along with Bella, has played a year of water polo. They also maintain a 4.0 GPA. Both girls want to swim in college. Not bad for two kids who quit during their first practice. There is a pattern to State of the Union addresses: The president declares the state of the nation is glowing; the opposition party reacts with skepticism; and then the two sides fight over which side won the night. With President Donald Trump there is an additional factor: Will he say or tweet something so outrageous that he kills the good buzz? In other words, will Twitter Trump step on teleprompter Trump? That the president gave a strong performance last week is clear. A CBS News poll found that 75 percent of viewers approved of the speech—and while supporters were more likely to watch the annual report to the nation than others, that margin is comfortably above the 46 percent of the popular vote Trump won in 2016 and suggests that many non-Trump voters liked the speech. It helped that Trump’s joint address to Congress focused, not on Trump, but Americans and their future. Khachigian’s favorite moment was when North Korean defector Ji Seong-ho waved his crutches—made for him by his father after a young Ji passed out from hunger while stealing coal from a train. “The speech had a lot of substance to it,” Khachigian added, and showed a Trump with heart. What’s more, Trump reached out to Democrats and sought their support for a compromise measure to extend President Barack Obama’s Deferred Action for Childhood Arrivals, or DACA, program. As a concession, Trump offered a path to citizenship to some 1.8 million undocumented immigrants who came to the United States as minors, through no fault of their own. To the right, Trump had conceded a lot. Many DACA critics see a path to citizenship as amnesty. Also, Trump had offered that path to more than twice the 800,000 undocumented immigrants initially covered by Obama’s DACA—and that program was temporary and paved no path to citizenship. In return, Trump argued Democrats would have to support his three pillars: funding for a border wall with Mexico, limits on “chain migration” to immediate family members and an end to the diversity visa lottery system. It was impossible to not notice the Democrats’ cold reception to Trump’s proposition. The Black Caucus’ reaction to Trump’s boasts about black unemployment hitting “its lowest rate ever recorded” was underwhelming. Only one caucus member applauded, and he stopped when he saw no others joining in. “Why are @TheDemocrats not applauding job growth, higher wages and the drop in Latino and African-American unemployment?” tweeted pollster Frank Luntz, a conservative who has been critical of Trump. Conservatives also broadcast photos of House Minority Leader Nancy Pelosi, D-Calif., scowling and sucking on her teeth throughout the evening. The next morning, Trump stayed off Twitter. Thursday morning, last week, he returned to his favorite social media platform with three tweets. The first chastised Democrats for not producing a single vote in favor of the GOP tax bill. The second hit Pelosi for not working with him on DACA. The third tweet trumpeted Trump’s belief that with 45.6 million viewers, his first State of the Union address had “the highest number in history.” But Trump was factually incorrect. Presidents Barack Obama, George W. Bush and Bill Clinton drew higher audience numbers than Trump for their first State of the Union addresses. But then, the public has become inured to Trump’s factual errors in his favor. Later, at a speech to Republicans in West Virginia, Trump pressed what he saw as his new advantage—the position where he appeared as a peacemaker and his opposition came off as belligerent and self-centered. During the tenure of Presidents Clinton and Obama, that was a charge Democrats frequently lobbed at GOP critics — that they were rooting against a strong economy and against the country. This week, the table was turned. The CBS News poll included more bad news for Democrats: 43 percent of Democrats approved of Trump’s speech. No cause for applause there. Both men are deluded or deceptive. Releasing the memo —while suppressing a dissenting assessment from other members of the House Intelligence Committee—was clearly intended to demonstrate that the FBI is a wholly owned subsidiary of the Democratic Party. The effort ended in a pathetic fizzle. Nunes’ brief, amateurish document failed to demonstrate that FBI surveillance was triggered solely or mainly by a Democratic-funded dossier. But for cherry-picking above and beyond the call of duty, Nunes deserves his own exhibit in the hackery hall of fame. This was a true innovation: an intelligence product created and released for the consumption of Fox News. Trump’s eager publication of the memo was expected. Yet his action crossed a line: from criticism of the FBI to executive action designed to undermine an ongoing investigation. Trump seems to be testing the waters for direct action against the FBI by testing the limits of what his Republican followers will stomach. So far, there are no limits. With the blessing of Republican leaders, the lickspittle wing of the GOP is now firmly in charge. The existence of reckless partisans such as Nunes is hardly surprising. The nearly uniform cowardice among elected Republicans is staggering. One is left wishing that Obamacare covered spine transplants. The Republican-led Congress is now an adjunct of the White House. The White House is now an adjunct of Trump’s chaotic will. And what to make of Ryan? I have been a consistent defender of his good intentions. But after the 17th time saying “He knows better,” it dawns that he may not. By his recent actions, the speaker has provided political cover for a weakening of the constitutional order. He has been used as a tool while loudly insisting he is not a tool. The way Ryan is headed, history offers two possible verdicts: Either he enabled an autocrat, or he was intimidated by a fool. I believe Ryan to be a good person. But the greatest source of cynicism is not the existence of corrupt people in politics; it is good people who lose their way. The United States Congress is an institution of great power. According to the Constitution, it can deny jurisdiction to the Supreme Court. It can remove the commander in chief. But now it watches as Trump makes the executive branch his personal fiefdom. It stands by—or cheers—as the president persecutes law enforcement professionals for the performance of their public duties. The political damage to the GOP as the party of corruption and cover-up should be obvious as well. This is a rare case when the rats, rather than deserting a sinking ship, seemed determined to ride it all the way down. But it is damage to the conscience that is hardest to repair. For Republicans, what seemed like a temporary political compromise is becoming an indelible moral stain. The Russia investigation is revealing a Trump universe in which ethical considerations did not (and do not) figure at all. Who can imagine a senior Trump campaign official, say Paul Manafort, or Donald Trump Jr., saying the words: “That would be wrong”? Their degraded spirit has now invaded the whole GOP. By defending Trump’s transgressions, by justifying his abuses, Republicans are creating an atmosphere in which corruption and cowardice thrive. How can this course be corrected? “You only have one political death,” said the late Rep. John Jacob Rhodes, R-Ariz., “but you can choose when to use it.” Larger showdowns—concerning the possible firings of special counsel Robert Mueller and Deputy Attorney General Rod Rosenstein —now seem likely. If there is nothing for which Paul Ryan and other Republican leaders will risk their careers, there is nothing in which they truly believe. Homeostasis, as defined, refers to the tendency of a body to maintain a condition of balance or equilibrium within its internal environment, even when faced with external changes. It can also refer to a state of psychological equilibrium when tension or a troubling difficulty has been reduced or eliminated. Looking back on my life recalls many a time when my homeostasis was fine-tuned and when it didn’t work to benefit my physical and mental well being. There were instances where I was out of sorts due to employment matters as well as others where my personal life and people in it were a lot less than helpful to my emotional health. Simply expressed, stresses and strains from multiple sources have resulted in good and bad consequences. There have been examples from political goings-on that provided me cheer and those that appeared to threaten me and the homeostasis of my country. In my lifetime, examples that stood out to influence how I felt and afforded sure-footedness were the election of politicians I could believe in. To the contrary, I think of how upset and even despondent I was as a young man when I learned that President John Kennedy was assassinated while I was heartened indeed by the leadership of President Lyndon Johnson to establish Medicare and the Voting Rights Act, both in 1965. There are, as well, events from U.S, history considered by Americans as positive and negative. Without a great leap of imagination for what came before my time in terms of the breadth and depth of sentiments and reactions on both sides of any argument, it seems possible that no event stands any taller than the threat to the American democracy that is underway at the present time. I regard that threat as the one looming over us as directed an guided by the Trump Administration and those Republicans in Congress who appear as his servile supporters and blind to his dangerous, nation-threatening shortcomings. Just look at the consequence of giving up our leadership in world trade: China is stepping in to fill the void. What about the prospects for world peace through nuclear war avoidance: We have abandoned it and there is no nation like the United States to stand in the way of a rogue nation. Then there’s the fate of a planet whose atmosphere is reaching critical mass in terms of its ability to support human life here: The world is becoming an every-nation-for-itself in the absence of the U.S. leading the way. These and other critical issues are now left to others without the will or way to guide the world toward positive developments. Also, consider what is happening and not happening at home. We’ve thrived and succeeded as a nation due to the influx of immigrants: The Trump Administration wants all immigration to cease. Members of the Republican Party in majority numbers have pledged their political lives to a president who only cares for himself and his family even though law-breaking profits and accumulating more wealth are rather obviously his their single-minded objective. Further, Trump abandons our democratic institutions and laws for a new order of things that strongly suggests a duplication of autocratic Russia. Then, too, among so much that’s highly disturbing is Trump’s meddling in the U.S. Department of Justice, its CIA and the FBI divisions, while seemingly too often further encouraging Russian interventions here. Trump plays to his base every day by tweeting his latest rant and rage. We are told that his base will cling to this president no matter what he says or does while Trump has told us that he believes he can do anything he wants to do without consequence. After all, he views himself as a celebrity who can grab what he wants to grab and take what he wants to take. Homeostasis is not survivable in the U.S. under a president who has shown us that he does not honor and respect the Constitution, the separation of powers, the laws of the land, and our valued traditions.